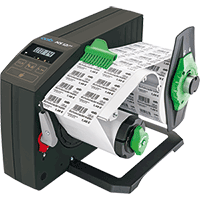 Every label size can be dispensed easily using the HS and VS dispenser. The labels can be stamped or cut without any space inbetween. You can use any outside shape whether cornered or round. Transparent material can also be dispensed. Two versions are available so as to ensure that the labels can be removed properly for every use. Peel off the label upwards from its bottom edge and stick it to the product. Peel off the label forward from its upper edge and stick it to the product from the shortest distance possible. Particularly suitable for larger labels as the adhesive side is already directed to the product. Use the operation panel to select various operating modes. This allows setting the feed supply rate to either "slow" or "fast". Labels are fed automatically after removal, by pressing a control key or upon an external signal. A counter indicates how many labels have already been removed. For round labels, the sensor will be set to the label's A apex. You can adjust the pre-dispense height B to between 4 and 18 mm. This puts the base material under tension so as to ensure that the labels will be dispensed safely. It can be swivelled away easily when the material is changed. Simply insert and clamp the backing tape immediately behind the peel-off edge. It is wound up completely by the strong motor. The label rolls are guided by the stable roll retainer. Device indicator "ON" green LED LED and label counter "ON"
To allow mobile labelling at every place where you do not have any socket outlet for power supply. HS and VS allow dispensing more than 5,000 labels using a single battery charge. The brake is used to tightly guide and precisely print fanfold material.